IPL 5 (IGN Pro League) in Las Vegas this weekend is host to not one but three StarCraft 2 tournaments, and one of the most interesting is the GSL World Championship, something akin to golf’s Ryder Cup, as the best of one region take on challengers from across several others. In this case, it’s Korea vs. the World in a mixed format competition. Things look pretty dire for the “foreign” side, however. The Korean team was chosen by their GSL rankings, meaning the five Korean champions are: Seed, MC, Squirtle, Life, and DongRaeGu. 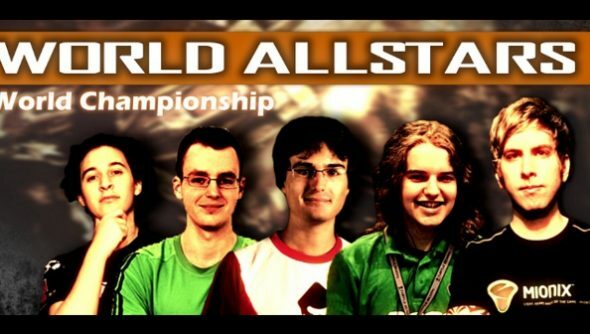 The “World All Stars” are: Stephano, Nerchio, LucifroN, Scarlett, and NaNiwa. Never has “foreigner hope” stressed the “hope” part quite so much. If they manage to pull off a win here, expect a StarCraft 2 version of Miracle, the Hollywood retelling of the US hockey team’s victory over the Soviet team in the 1980 Olympics. The tournament begins on Saturday, December 1st at 10 PM GMT / 5 PM Eastern. The first day is a best of five 1-on-1 matches on single maps. The second day (Dec 2nd, at the same times as Day 1) is all-kill, the preferred format of the GSTL. Both teams pick one player to go up first. The winning player stays, as if this were a battle at an arcade, and he or she will keep playing until either the other team has no one left to send, or until the other team manages to get a victory. The winner is the last team standing. If both teams are tied after that, the tournament is decided by a 1-on-1 best of three between champions of the teams’ choosing. Korea has sent over a murderer’s row by any definition. Lee “Life” Seung Hyun holds last season’s GSL title, which he took in an amazing seven game series from Mvp, who is the most successful player in SC2 history. He also won the MLG Fall title despite fierce opposition from other Korean stars. Park “DRG” Soo Ho was dominant at the start of this year, taking an MLG and a GSL in short order and getting podium finishes just about everywhere else. While he’s fallen off a bit since the summer, he’s still a consistently excellent Zerg player. Jang “MC” Min Chul is a perennial championship contender and arguably the most consistent Protoss in progaming. Park “Squirtle” Hyun Woo is less accomplished, but he’s come on very strong this year and appears to be on the up-swing. Ahn “Seed” Sahng Won took his first GSL championship earlier this year and placed well in some smaller tournaments. The World All Stars are, perhaps inevitably, more of a mixed bag. Two players were specially invited, and three were chosen by popular vote. The invited players were Johan “NaNiwa” Lucchesi and Ilyes “Stephano” Satouri. When they are on their game, both are incredibly formidable. But NaNiwa, especially, has a mixed reputation due to years of controversies at competitions and friction with his teams. He has had some strong performances, particularly at MLG tournaments, but 2012 has been hard on him. 2012 has been Stephano’s year, although his performance has been more uneven since the summer. He won the Lone Star Clash in November as well as the European Finals in the WCS. But he fizzled in Shanghai and was a nonentity again last week at DreamHack. Of the other players, Poland’s Artur “Nerchio” Bloch might be the strongest of the group. He’s enjoyed a great deal of success on the European circuit, winning the HomeStory Cup and the DreamHack Open in Bucharest just last month. He played well at DreamHack, making it as far as the semifinals before getting blown out by NAME. Sasha “Scarlett” Hostyn has emerged as one of the North America’s rising stars this year, easily winning the North American Championship in the WCS. Pedro “LucifroN” Moreno Duran has likewise had a strong year, fighting alongside and against his brother VortiX to dominate several European tournaments, taking first in the Spanish Nationals in the WCS and finishing third in Europe. Even with all these accomplishments, however, most of these players are still more renowned for their potential rather than their record. Stephano is the exception here, but even in his case, most of his successes have come from the European tournament scene where only a handful of top Korean players compete. Meanwhile, the Koreans have established records of success facing the absolute best players in the world, again and again. Any one of them is capable of pulling off an all-kill against the World team, and I’m not sure you can say the same about anyone on the other side. Still, the format of the tournament raises the possibility of “sniping” victories. The first round contestants know who they are playing and where, which gives the World All Stars players some time to gameplan. The all-kill round is going to be tough for them, so they really need to make sure they get three wins out of Round 1 and then gameplan for a Round 3 decision. Stephano is the obvious choice there, which means it might make more sense to surprise the Koreans with a different pick. The meta strategies for this tournament could be very interesting but, with only $9200 on the line, we’re just as likely to see a series of showmatches instead of a fierce competition.